Ever try to photograph a flame, outside, surrounded by water. Here’s how I did it. 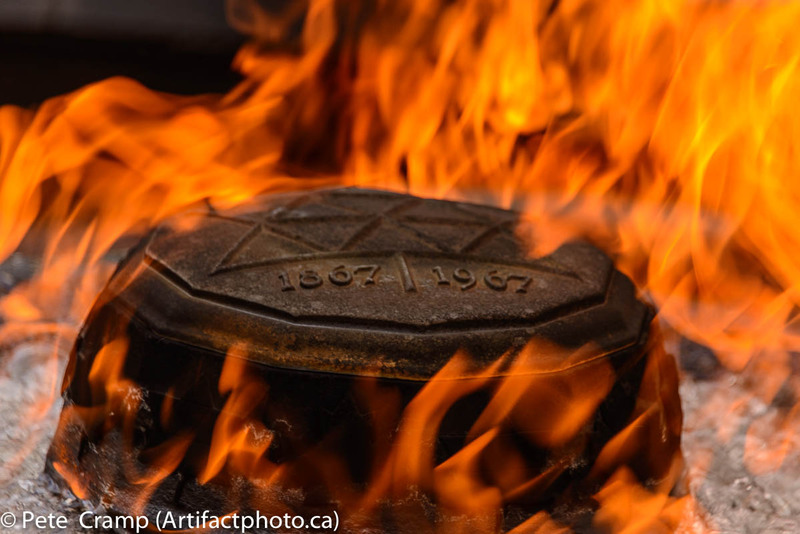 Fifty years ago, the eternal flame was lit at Canada’s Centennial. 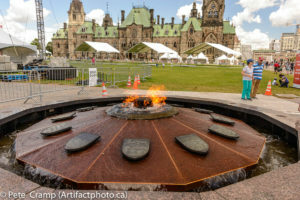 For this year’s 150th Canada Day, we returned to Ottawa and the image of the flame seemingly coming out of the water around the Centennial Medallion seemed to symbolize Canada quite well. The flame sits in the middle of a fountain., but rather than the usual gas-jet, the gas that feeds the flame is released as bubbles in the water and as the bubbles break the surface, the gas ignites from the already lit flame. It looks really cool! The water rushes around medallions for each of the eleven provinces and territories that made up Canada in 1967 — Nunavut wasn’t formed until 1999, and the flame dances around the Centennial Medallion in the centre — it’s quite a work of art and engineering. Not the simplest thing to shoot, it mainly takes a little planning, and a bit of repetition to get a shot like this. First, you can see from the wide shot that the site was cluttered with preparations for Canada Day underway. Not a great backdrop for the symbol of Canada’s promise for the future. So, naturally, we needed to go in close. I wanted the flames to appear as flames, but not static, frozen flames, nor blurry, lens-flare-imitating fire. To keep digital noise at bay, I tend to shoot at a low ISO, such as ISO 100. In this case, I went with ISO 250, because I was hand-holding a telephoto shot (300 mm) and wanted it crisp. The shutter speed worked out at 1/100th of a second at f5.6, for the photo nerds out there. The Eternal Flame sits at the centre of the Centennial Fountain on Parliament Hill. Next challenge: how to get a white balance. Usually, I carry a grey-card with me, but of course, I would be going through security at the Parliament Buildings, so I left it in the truck. If you look at the wide shot, you can see a battleship grey tent off to the left side. I used that as the grey card and got a colour temperature of 7300 with a tint of +19. Good enough. I applied that to all of the versions of the flame, as well as my not-so-secret-sauce of clarity 40, vibrance 20, and saturation 10. I shot about ten versions of the flame and picked the one I liked best. I try to get these out every Monday at 9:00. If you like them, follow me on Facebook, or better yet, use the fancy contact form on my web page at artifactphoto.ca, and I’ll send you reminders whenever I publish a new blog.